A lot of books deal with steps to innovation and they argue whether seven steps are better than twelve. Cause A Disturbance delivers a very practical way of understanding your business a little better, to understand your customer and to understand how to keep engaging with new, better and improved ideas. If you are an innovative entrepreneur, this book interview is for you. I think this is written from a very practical and entrepreneurial voice. A lot of books deal with steps to innovation and they argue whether seven steps are better than twelve. This is just a very practical way of understand your business a little better, to understand your customer and to understand how to keep engaging with new, better and improved ideas. Well it’s in the title, cause a disturbance. You always have to be thinking about your next step, your next opportunity, the next way you can reengage your customers. If you don’t, your competitors will. There are four parts to the book. The first one describes why I wrote it. It’s all about simplifying innovation. I start with a very simple example of a cake pop. It’s like a piece of cake formed like a lollypop on a stick that a baker created out of some leftovers. It’s gone on to sell millions of units around the world. It just shows people that innovation doesn’t have to me monumental. It’s not just about products and services, it’s also about processes. Once you understand part one of the book, I get into defining your core business. A lot of people actually don’t understand what business they are in and what I mean by that is they talk to the commodity like “I make chairs” or “I sell pencils”. I use the example of Starbucks a lot of the time. The reason it’s grown is because Starbucks didn’t focus on the fact that it was selling coffee, it focused on the fact that it wanted to be an incredible meeting place. Moving from thinking about a cup of coffee to the human dynamic, how people want to meet, how they want to relate to one another. That enabled Starbucks to become this giant successful company when so many others are still one off. I think that getting away from the commodity, that thinking about your purpose is really important and it doesn’t matter what business you’re in. 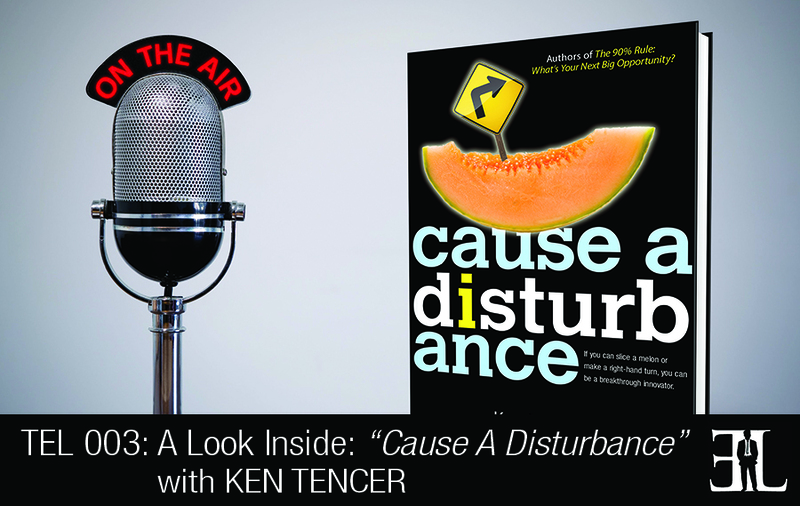 In part three of the book we go through six steps to the process behind causing a disturbance. We also have some ways to build teams and get things to market. The fourth part of the book we call the next ten percent. It’s my basic philosophy of getting up in the morning ask yourself what the next ten percent is. What is the new idea that you are going to bring to market? That turns the six steps that we talked about into an everyday function in our business. You have to get up every day and think about how you are going to delight your costumers one more time. In the last part of the book we give you tips and ideas for you and your team on how you can do just that so that it becomes as natural as accounting or selling or anything else you do in your business. I started, built and sold a manufacturing firm 20 years ago and moved on to services where I help other entrepreneurs understand a little bit about the opportunities they have in front of them. I know what it’s like to get something going from scratch and all the fun and games along the way. The inspiration comes from lot of people I’ve spoken to. I’ve been very fortunate since our first book came out in 2010 to speak to and to do workshops with thousands of people around the world. One thing that stuck out was they all seemed to have this mystical idea of innovation that it was monumental; that you had to be a large company and I just didn’t see it that way. I really wanted to let people know that it’s just not that hard.